Home Uncategories Can Daniel Norris help the Tigers now? 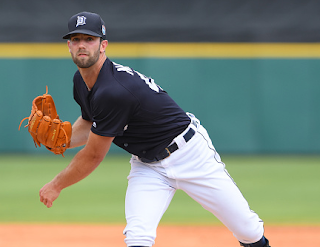 Can Daniel Norris help the Tigers now? The Tigers are still in need of some help in the starting rotation. Michael Fulmer's surprising emergence as a dominant starter certainly provided some extra stability, but it's going to be difficult to remain division-title contenders if Matt Boyd and Mike Pelfrey are the go-to guys at the back end of the rotation. Matt Boyd is, you know, okaaaay, but he gets all self-conscious and weird after about four/five innings and twice through the batting order, and then he acts out by giving up lots of extra hits and runs. That won't work. Mike Pelfrey is ... well, he's Mike Pelfrey. I made a drinking game you can play during Pelfrey starts, but it would probably kill you because it contains conditions like such as "Drink if ..."
Anyway, the point is -- as you'll see if you just re-read the headline of this post -- the Tigers need help in the starting rotation, and Daniel Norris is ready and waiting in Toledo. Well, he's waiting, anyway. Whether or not he's ready is another subject. Norris has overall numbers that are decidedly uninspiring: in 56 2/3 innings, he's racked up an ERA of 5.24 with a 1.606 and a not-very-good BB/9 (walks-per-nine innings) of 4. However, #TeamNorris will point out that his K/9 (strikeouts-per-nine innings) is a healthy 9.8, and his FIP (which takes the Mud Hens' questionable defense out of the equation) is a shiny 2.45 -- and after all, his ERA is artificially inflated by a few very bad outings early on in April. Maybe a fairer examination would be to just look at his last five starts, since Boyd only has four starts in MLB this year, and that's what we're judging him on when we talk about replacing him with Norris. In that case, Norris has thrown 28 1/3 innings (an average of 5 2/3 IP per start), posted a 3.18 ERA and a 2.10 FIP, and an eye-catching 10.2 K/9. On the down side, his WHIP in that span is still 1.341, and his BB/9 is still 3.8 -- for a reference point, Boyd's BB/9 in his four starts is 3.4 and his WHIP is slightly higher at 1.428. Enough numbers, though. Let's talk about what the naked eye reveals, because let's face it, neither of these two pitchers has an established track record that makes their numbers predictive. They are both still "prospects" whose evaluation needs to include a few tablespoons of See-for-Yourself. So is Norris an improvement over Boyd, or Pelfrey? He certainly has the potential to be leaps and bounds better than either of those two starters, but at the moment, in the present day, I don't think Norris will provide a big uptick in actual results. Yes, his pitch arsenal and movement are wonderful, but it cannot be stressed enough: his command is very inconsistent, and that takes a lot of the shine off of his "stuff." That high fastball that gets a swing and miss is as beautiful as his way-off-the-plate fastball for ball four is ugly. Boyd and Norris will provide both unsatisfying and satisfying results, but in two different ways. Boyd will more easily give up home runs, but Norris will be inefficient and walk too many batters, while mixing in some hard contact. Boyd can be efficient and get quick outs on weak contact, but Norris will be filthy and get more strikeouts. Boyd will have to leave the game in the 5th inning because his stuff isn't dazzling enough to fool a lineup the third time through the order, but Norris will have to leave the game in the 5th inning because his command sucked and he threw 102 pitches. So should the Tigers bring up Daniel Norris? Sure, why not? It's not like he's going to be any worse than Boyd or Pelfrey. But I wouldn't expect him to be the Savior of the Rotation either. It's probably a lateral move at best, with the caveat that, if Norris can get even 10 percent better with his command, he'll immediately get better results than anyone in the rotation not named Verlander, Fulmer, or Zimmermann. Once he fully develops, though, and finds consistent command? He's easily a solid #2 starter who could be every bit as dominant as the version of Michael Fulmer we've been watching this season.